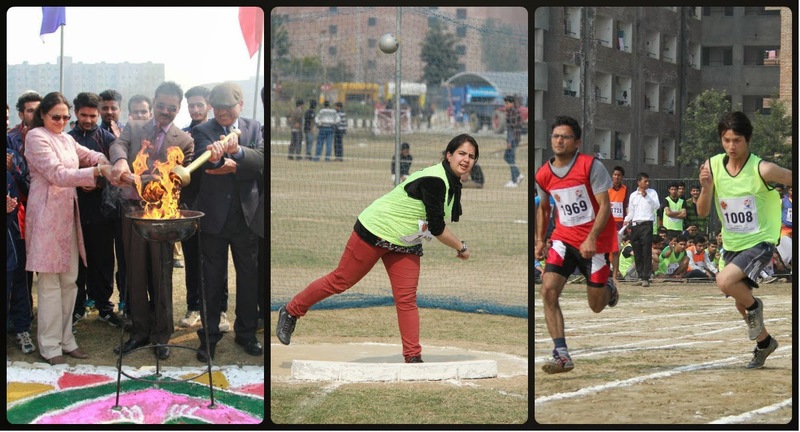 Jalandhar: LPU is organising two-day 6th annual sports meet of the university at its sports stadium. Beginning with symbolic torch relay invocation, the first day of the meet brought forward talented sportsmen and women of the university. On the inaugural day finals for shot put, long jump, discus throw, triple jump,1500 mts & 800 mts races; semi finals for 100 mts race; and heats and rounds for 400mts, 4x400 mts relay and 4x100 mts relays were held in both men and women categories. Final for 5000 mts race in men category was also held. Before this colourful march past on drum beats was held where 40 contingents comprising thousands of participants in sports kits gave an Olympic look to the meet. The meet was declared open by LPU Chancellor Mr Ashok Mittal who wanted assurance from the university sports persons about their being talented enough to one day participate in Olympics. In different competitions held, Mahesh Singh (Deptt of Physical Education) took 17.45 minutes to be on the first position in 5000 mts race; whereas, Kirandeep Singh of Distance Education took 17.53 min to be on second, and Vinod Kumar of Paramedical Sciences on third position with 18.55 minutes time. In 1500 race for men again Mahesh Singh proved his stamina to be first with 4:46:66 minutes time; Ami chand Giri of Agriculture Deptt second with 5:00:78 minutes & Jay Aasheesh Singh of School of Business third with 5:07:31 minutes. For women, Harwinder Kaur (6:30:01 minutes) and Vibha (7:45:03 minutes) of Phy Edu were first & second respectively, and Ramandeep Kaur of Computer Application remained third with 8:05:81 minutes. For shot put (men) Paramjit Singh of Phy Edu (9.64 mtrs) was first, Shubham of Civil Engg (9.22 mtrs) second, and Vikram of Mech Engg (8.88 mtrs) was third. In women category, Cloudiya of ECE (8.17 mtrs) remained first, Silvenia of Paramedical Sciences (7.55 m) second and Sukhdeep of Phy Edu (6.76 m) third. In the competition for long jump (Men) Avisa of Phy Edu (5.61 m) declared first, Simandeep of Distance Edu (5.50 m) second, and Sarvesh of CSE (5.44 m) third. For women, Balveer Kaur (4.02 m) & Amandeep Kaur (3.72m) of Phy Edu respectively remained first and second, and a student of Architecture & Design, Sonam (3.38 m) was third. Triple jump (men) saw Sarvesh of CSE first with 11.56 mtrs jump, Naveen of Hotel Management second with11.41 mtrs and Basuki Nath of Mech Engg third with 11.15 mtrs jump. For women, Balveer of Phy Edu was first with 8.86m jump, Meena of ECE second with 7.93 mts, and Priyanka from School of Business third with 7.35 mts jump. In discus throw (Men) Navjot of Phy Edu with 25.45 mtrs throw remained first; Punit Rai with 24.96 mts second; and, Ramandeep Mehwi of CSE with 24.09 mts throw stood third. In women competitions, Cloudiya of ECE declared first with 27.71 mts throw; Harpreet Kaur (16.27 mtrs) & Satwinder Kaur (16.14 mts) both of Physical Education remained second and third respectively. In 800 mts race For men, Anit Kumar of Phy Edu remained ahead by running the race in 2.13 minutes, Kirandeep Singh from Distance Education stood second by taking 2.16 minutes, and Aman Rawat from School of Business was third for taking 2.25 minutes. For women all the first three positions went to Deptt of Physical Education with Harwinder Kaur (3.12 min) first, Promila (3.31 min) second and Vibha stood third by completing her race in 3.35 minutes.